The user interface is what the player uses to directly control the game. The player can interact with most elements on the user interface by left clicking on a menu button with the mouse. However, not all elements are clickable and will instead provide useful information to the player during gameplay. 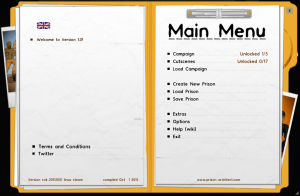 In Prison Architect, the user interface comprises a menu with several options and settings, a horizontal bottom bar that contains the many elements the player can use in the game, a horizontal top bar that contains useful information for the player, a clock for time, a sticky note that lists objectives on the upper-left corner of the screen, and other UI elements that will be mentioned in this article. The main menu is what controls the game by allowing the player to start a new campaign or sandbox game, save and load previous games, change the graphical and audio settings for the game, enable mods, etc. It can be accessed by pressing the ESC key on the keyboard or by clicking the little home icon in the upper left part of the screen. See Menu for a more detailed description of what can be done in the menu. On the top of the screen, the Top Info Bar permanently displays important information like the Danger level, the current balance or the number of prisoners. On the bottom of the screen, the Bottom Menu Bar offers the main control element: menus to build rooms and object, hire staff, toggle overlay views with detailed information, open menus for advanced logistics, call emergency units and actions, open reports with detailed information and policy settings. In the upper right corner of the screen, The Clock displays the current time and prison regime, and game speed can be adjusted. In the upper left corner of the screen, the To-do List will display what is currently to be done or expected to happen in the near future. Some more serious events, like riots going on, will be announced with text overlays for bigger parts of the screen. (Not to be seen on the screenshot above). The top info bar contains useful information that the player can use to quickly gauge the overall status of their prison. It can be dragged and moved, if you want it to be somewhere else. For more information, see Danger. The danger meter serves the player by alerting them whenever prisoners are angry or upset about the way things are being handled in the prison. It will accumulate exclamation points as more prisoners become angry, and in most cases a Riot will occur if the meter gets filled or if too many prisoners are fighting at any given time. Hovering the mouse over the danger meter will show the player all of the positive and negative events affecting the prisoners. For example, having your prisoners well-fed will result in a positive event and will decrease your danger levels. However, having Riot Guards or Armed Guards in your prison will result in a negative event and will increase your danger levels. Prisoners who are suppressed will also appear here as a neutral event. The player must research security, and must also hire the Chief before this can be seen. The day counter is just that, a day counter. For every 24 in-game hours that pass, or once the clock hits 12:00AM, a new day will be counted. The tooltip shown when you hover the mouse over this counter shows you how much of your real life's time you have wasted with building the current prison. If Temperature is enabled, the current season will be displayed here, too. The balance shows the player how much money they can immediately spend in-game. Money is spent on hiring Staff members, constructing Materials, placing Foundations, ordering Objects to be placed, and more. Money is primarily earned through the federal grant that is given to you every day based on how many Prisoners you have in your prison, and their risk level. However, money can also be earned through Grants, prisoners working in the Workshop, and more. Clicking on it opens the Grants Report Menu. The tooltip displays a list of recent transactions. This serves the player by showing them how financially stable their prison is. If the numbers are green, then you are in the positives and will receive that amount of money on the start of the next day. However, if they are red then you will lose the amount it displays from your balance. Keep in mind, without an Accountant you will not be allowed to enter the negatives, and won't be able to hire new Staff members that increase your daily expenses beyond the allowable limit. Clicking on it opens the Finance Report Menu. The tooltip gives numbers for daily income and debt. This counter shows the player how many Guards they have available, and how many guards they have in total. Guards become unavailable primarily when they are on Patrols or stationed in a room. However, guards can also go unavailable when they are escorting prisoners to their Cells, are in the middle of searching a prisoner for Contraband, or are unconscious. Clicking on it opens the Staff Report Menu. The tooltip is giving an overview of which jobs are currently done by guards. The player must hire a Guard before this can be seen. 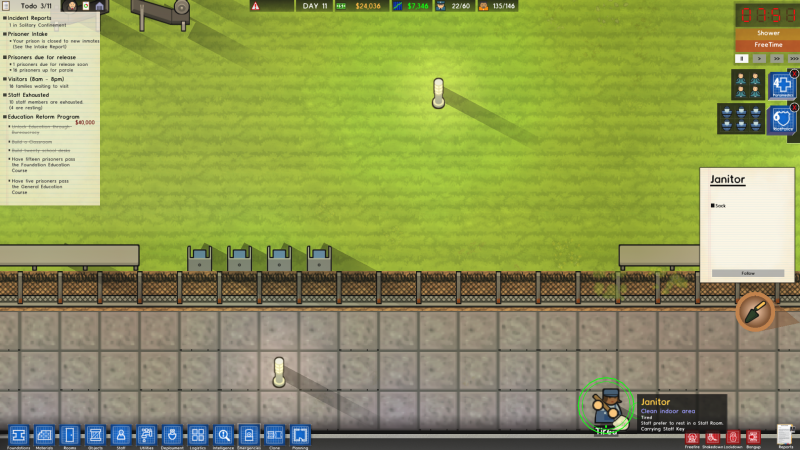 This counter shows the player how many Prisoners they are currently responsible for, and how many prisoners can be safely held within the prison (i.e. the number of cells plus the number of beds in dormitories and holding cells, with Bunk Beds counting twice). If these numbers go red, then that means you have exceeded the safe capacity and should start building more Cells to hold more prisoners. However, the player can continue to receive prisoners even after the safe capacity is reached. Clicking on it opens the Prisoners Report Menu. The player must construct and label a Cell that meets requirements, or a Prisoner must arrive at the prison before this can be seen. The bottom menu bar contains buttons that the player can interact with by left clicking with the mouse. Most of these buttons open up smaller menus with other items that can be used to directly influence gameplay. Some of these buttons will be unavailable at the start of a new prison and may require you to research them first. For more information, see Foundation. Clicking on this opens a small menu which contains a tool for building foundations, and a tool for removing foundations. Foundations are essential for Rooms that need to be indoors. This is the only way to create a structure with a roof. For more information, see Material. Clicking on this opens a menu which contains the various placeable materials that the player can use which include walls and floor tiles. Not all materials found in the game will be included in this menu, like Water. For more information, see Room. Clicking on this opens a menu which contains the various room types that the player can designate throughout their prison. For more information, see Object. Clicking on this opens a large menu which contains the various placeable objects that the player can use to furnish their prison with. Not all objects found in the game will be included in this menu, like those seen in the Deathrow campaign. Many objects found in this menu will only appear to the player when they are zoomed into an appropriate room that has an object requirement. To force all of the objects to show, the player must click on the + icon located on the bottom-right corner of the objects menu. For more information, see Staff. Clicking on this opens a menu which contains all hireable staff members that can work in your prison. Both administrators and personnel will be shown here with the exception of the Teacher. For more information, see Utilities. Clicking on this opens a menu which contains both electrical and plumbing items which can be used to provide power and water to your prison. This will also switch the player's view into the utilities view which shows all installed wiring and piping. For more information, see Deployment and Sector. Clicking on this opens a menu which contains tools that allow the player to station and set the patrols for Guards, Armed Guards, and Dog Handlers. Secondly, the menu contains the different sector security levels that the player can set for different rooms and facilities. This requires you to research deployment before it can be used. For more information, see Logistics. Allows the user to control Food, Laundry and Prison Labour distribution as well as to check the cell gradings. For more information, see Intelligence. Clicking on this opens a menu which contains tools that allow the player to determine which rooms are most prone to contraband being stolen. This will also switch the player's view into the contraband overlay view which shows the player all possible locations where contraband can be stolen, and the paths of each piece of stolen and found contraband. This requires you to research contraband before it can be used. The menu also gives an overview over the Confidential Informants. For more information, see Emergency. Clicking on this opens a small menu which contains the emergency units that can be called by the player during emergency events. It includes the Riot Guards, the Firemen, and the Paramedics. Clicking on this sets the player into cloning mode, which gives them the ability to right-click and drag an area of their prison up to 12x12 to copy. Once done, the player can left-click a new area to paste whatever they cloned. The copy stays in memory until something else is cloned, which allows for quickly building multiple cells at a time. The cloning tool will copy Objects, Materials, and Rooms. It requires you to research clone before it can be used. For more information, see Planning. Clicking on this opens a small menu which contains tools that allow the player to set transparent walls, paths, and blocks that help with planning a new prison. Emergency actions are controlled by the player and can be toggled on or off at any time. For more information, see Freefire. Causes all Armed Guards to immediately equip their shotguns, and commands all Snipers to no longer fire warning shots before shooting a prisoner. The Freefire button is only displayed if you have hired at least one Armed Guard or Sniper..
For more information, see Shakedown. Causes an immediate search for Contraband in every object capable of holding it (inmates, food, furniture, etc.). For more information, see Lockdown. Causes all doors currently installed in your prison to immediately close and lock. Nothing can open the doors (with the exception of prisoners breaking them open) unless you manually override the Lockdown on a specific door from its menu. For more information, see Bangup. Forces all willing prisoners to return to their Cell and stay there until the player turns off the bangup. Unwilling prisoners will face your prison security. For more information, see Roll Call. Wakes up all prisoners at night and forces them to stand in their cell doorway. Any prisoners who happen to be tunnelling at the time of the roll call will show up late, giving away their plans. The reports button opens up another part of the user interface that contains even more detailed information about your prison, and the prisoners within its walls. Such information includes your financial status, how many prisoners you have in each security level, the current progress of your Programs, the Needs of your prisoners, and more. The clock is the next essential part of the user interface because it directly tells you what time of day you're at, and what is currently scheduled to happen on the Regime. If Temperature is enabled, the current outside temperature (in °C and °F) will be displayed here, too. The clock's and thus the game's speed can be adjusted by the player to stop, go at normal speed, two times the normal speed, or five times the normal speed. Note that you can also build, command staff and adjust settings in reports and menus in pause mode. The clock's speed will also be adjusted depending on the starting size of the prison. Starting a prison on the small map size results in a faster clock, while the large map size results in a slower clock. 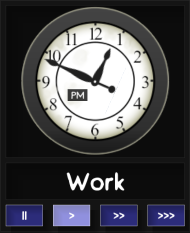 In the Main Menu options, the clock can be set to be a digital one. In both cases, the clock can be dragged and moved to different locations of the screen. If the player clicks on the scheduled regime event, it will open the Regime Report Menu. For more information, see Todo list. Any Grants that you have started, and the objectives required to complete the grant. This will also show how much money will be awarded upon completion. 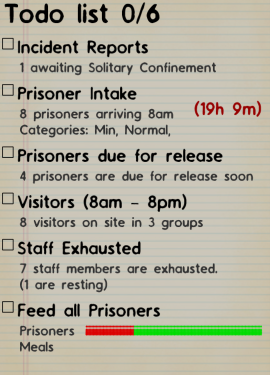 An incident report that tells the player how many prisoners are in Solitary confinement, and are awaiting solitary confinement. The details for your next prisoner intake. This will show how much time is left until your next prisoners arrive, and what security level they will be. A list of prisoners that are due for release soon. Each prisoner will display, in hours, how much time they have left. Only prisoners who have a few hours left will be shown here. How many visitor groups are currently on site. It displays the time visitation begins and ends. Any exhausted staff members that need rest, or are already resting in a Staff Room. How many prisoners are hungry and how many are fed. Hungry prisoners will display as red bars, while fed prisoners display as green bars. Meals will display how much food has been made. The Todo List can be collapsed (and expanded) by clicking on its header. Through here, the player is able to research new rooms, staff, objects, and other functions for their prison. This requires you to hire a Warden before it can be used. This basically is a consolidated version of all your released prisoners' gradings. The entity options is the final most important part of the user interface as it allows players to directly interact with the Objects and Staff members that are in their prison, among other things. This interface only appears to the player when an entity is clicked on, and if the entity can be changed by the player. The three most common options that players can choose from is to dismantle, dump, or sack the entity. Dismantle calls for a nearby Workman to remove and store the object in the Storage room for later usage. Dump calls for a nearby workman to instantly trash the object. 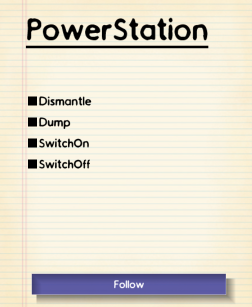 Switch On and Switch Off only applies to Power Switches, Power Stations, Capacitors, and Pipe Valves. It toggles power or water from flowing into the targeted object. Connect and Clear Connections apply to wired objects like the CCTV camera and start the "Connect" mode from the Utilities menu or remove all wires respectively. Doors do have the three door modes Normal, Locked Shut and Locked open. See Doors#Permissions for explanations. Open on Trigger and Close on Trigger only apply to Door Servos, see there for an explanation. Search may reveal any contraband contained. In case of a Toilet, this will reveal any Escape Tunnel starting here. Search cell and Search cell block will cause all objects in the cell or cell block to be searched. In case of an object not being located in a cell, both options refer to the room it is in. Sack will instantly fire them from your prison. Additionally, all Entity Options menus will offer a Follow option by which the camera will follow the object until the option is deactivated. In the prisoner profile, there is no button "Follow", however, clicking on the prisoner's mugshot will have the same effect. This page was last edited on 28 June 2018, at 19:01.